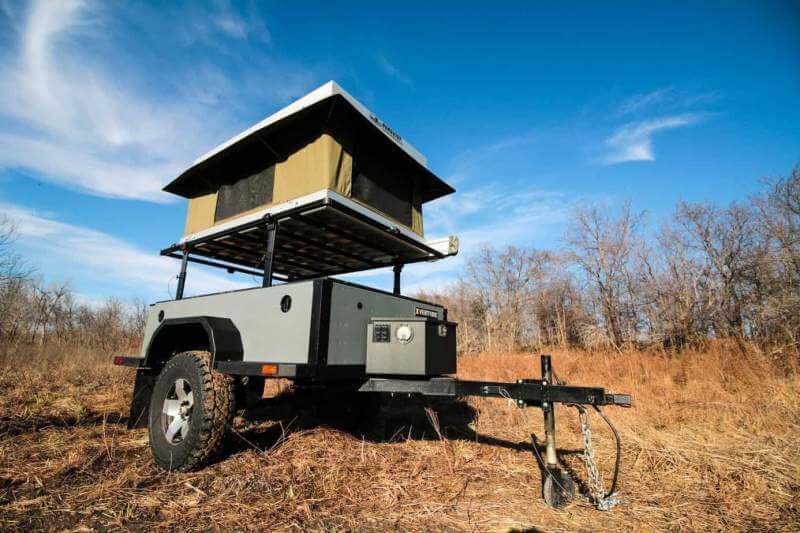 Today we will be looking at long debated questions regarding roof top tents. What should we consider when comparing them to ground tents and also trailers. We are often pushed to decide between various camping methods due to the requirements of certain products. But how can we decide and be comfortable with our choice? With an informed decision. We will look at all the pros and cons and suitable requirements for each, and compare them together with their best features. This should help you lean towards 1 or the other when considering your preferred style of camping. A common debate among roof top tent owners is where to mount it, on the roof of your vehicle mounted to a roof rack or mounted onto your trailer that you’re pulling. We are going to compare some of the pros and cons for each method which will help you decide which is better for you. As this answer to this question is 100% situational, there is no right and wrong. People may find that you have more utility when the tent is mounted to the roof of the vehicle as opposed to the trailer. It’s more compact and if you are bringing a trailer regardless you have much more storage. Plus you have more freedom in movement if the tent is mounted on the roof. The argument for storage could go in favor of the trailer tent, this is because with the RTT mounted on the trailer, you have the whole roof of the vehicle free to store things like kayaks, canoes or other camping equipment. Depending on the design of the RTT, you may have better aerodynamics with the tent on the trailer. But this really depends on the dimensions of the trailer as well. As long as the trailer fits within the shadow of the vehicle, meaning it doesn’t extend the width of the vehicle or height, it shouldn’t effect wind resistance much at all. There are some other variables like the length of the trailer and the distance from the bumper to the trailer that can make a difference, but generally speaking a trailer includes less wind resistance. Before we answer this question note that both options will affect your gpm, there’s really no avoiding this when you attach more weight to your vehicle. With that being said, it’s widely noticed that a RTT effects the mileage more than a trailer with mounted RTT. But the difference is slight and it’s not considered a deal breaker or substantial by any means. A RTT will allow you to camp in places that are impossible to reach with a trailer. With the tent attached directly to your vehicle this will allow the freedom of venturing wherever your vehicle is capable of going. With a trailer you are limited, then if you detach the trailer and do venture off, you will need to leave the trailer behind. Although they do have locks, I feel it could still be a security risk, depending on where you left it. Of course with a RTT you can maneuver better while driving as opposed to driving with a trailer. You can also benefit from easier parking and turning etc. However veteran drivers who use trailers regardless would not feel this as much as newbies venturing out for the first time. As we mentioned RTT are better for the get up and go style with more freedom, however if you are intending on setting up a basecamp style of camping the trailer is better for this. They provide a better foundation and just generally easier to deal with as they aren’t so high up. RTT’s are better when you are just visiting an area for a few days then hitting the roads again shortly after. As you may have read already in our tips guide, roof top tents are mostly 2-4 person tents, at maximum we have seen a 5 person tent (which is more for space and gear as opposed to cramming 5 people on a roof). Generally 2 or 3 at most is deal for roof top tent camping. For this purpose an RTT will win over a trailer. However, if you are camping in larger groups of over 4 people, a trailer is much more ideal. Given the option for basecamp and more storage. Also the lower height is much more convenient for bathroom breaks and general sleeping habits, especially with children. They both have pros and to be honest they share many of the same pros, they are both great choices. However your specific situation will determine which is better for you. The 2nd comparison that is often made is the difference between roof top tent camping vs. ground tent camping. Comparing modern methods with the traditional is a comparison made continually in all aspects of life. With the rise of modern equipment in camping we are often pushed to compare new methods with the more traditional roots of camping. We don’t want to lose the feel of camping but we can’t help but be intrigued by these new, flashy contraptions that supposedly make our lives a million times more convenient. Popularity originated in Australia to avoid the dangers of poisonous snakes and spiders which are abundant there. The popularity spread to New Zealand as it’s an economical choice compared to buying an RV. The elevation is considered a huge benefit and pro for Roof Top Tents when comparing with a ground tent. Outside of Aus and NZ, in America and Canada, we have heard stories of people converting to roof top tent camping due to close encounters with bears and the like. Being in an elevated position on a large vehicle can have its benefits in these situations. You also naturally encounter less bugs and insects from an elevated position. Lots of bugs hover on the surface of the ground make it easier for them to nab your ankles and legs while you’re sat in your tent or by the fire. We will all encounter these outside our tents, whoever in an RTT you evade this when it’s time to sleep and chill. Initially an RTT would be more demanding with the mounting process. But once mounted they outperform ground tents in terms of speed and ease of set up. Probably 2nd only to Pop up Tents, the roof top tents are super easy to set up due to their folding mechanism that allows them to open and close instantly. Instant tents and Inflatable Tents can also set up pretty quickly, however if for example we ran a test of 100 or 1000 set ups with a pop up tent, roof top tent and instant tent. I’m sure the mechanisms and coils on the ground tents wouldn’t be in original shape. Whereas a roof top tent with stainless steel hinges for example, would still be going smoothly. One issue that may be found for hikers and people who enjoy activities like canoeing, kayaking and biking. Is the fact that the roof top tent takes up valuable space on the roof rack. Taking up pretty much all of it, so you would need to use a rear bumper for the bikes etc, making the vehicle a little more cumbersome than usual. The Roof Top Tent has a much smaller footprint than a ground tent. Compact in size and also can be positioned to be parallel with your vehicle, they basically take up the same space as your vehicle would. Of course unless you attached an annex but then that’s also only a small area on the side of your vehicle. An advantage of the RTT is the fact it can be pitched over any terrain. Wherever your vehicle can go, you can sleep. This isn’t true for the ground tents. The only way a ground tent can be used over rough and rocky terrain is by using a Camping Cot add on. However with the RTT, you can park up on any ground, and sleep well given the elevation of the sleeping area. Debatable but it’s been widely observed that an RTT offers a more comfortable sleep. Now this may only be an issue for people with height issues. But for the most part, given the price of roof tents, they put a lot of effort into the sleeping areas. Integrated mattresses that are made of foam 2.5 inches thick, it’s a comfortable area. Whereas on the ground, you need a pretty thick bedding or mattress to forget the feeling of the hard ground beneath you. A pro for the ground tents is that the wind can be felt much less given the fact you are closer to the ground level. A roof top tent, elevated and with no nearby wind blockages, like trees/walls etc., is completely open to the wind. It can be felt much more and it can additionally cause a lot of excess noise when it bashes upon some of the more loosely crafted tents. People have said that they felt like they had more privacy when using a roof top tent. This is probably due to the fact that they aren’t easily accessed, as opposed to a ground tent where you can just waltz on in at any point. With the RTT a ladder must be climbed which give you enough time to shout STOP! Pro for ground tents, you will save a ton of money by using a ground tent. We will not discuss quality here, only price and for this ground tents win hands down. You can get a quality backpacking tent from around $200 upwards, where as a quality roof top tent would start at least around $900 for a basic 2 person Tepui for example. Consult our buyers guide for more information on what you can expect for your money. A pro for the RTT is the material commonly used is super waterproof with quality waterproofing properties. This gives them substantial HH ratings, usually around 2000-3000 and upwards. A standard ground tent usually has around 800-1000 for a backpacking tent. They tend to leak in heavy rain and need additional waterproofing to last in bad weather. Roof top tents are generally 4 season tents across the board, due to the tough, durable materials used in the manufacturing. Perhaps a con for the RTT is that when you are driving, you will definitely notice the extra load, and you will have to drive more cautiously with this on your mind while traveling. With a ground tent camping trip, it won’t be so much of an issue, allowing you to travel as you normally would with a clearer mind. There is less stability while driving with a roof top tent. As we mentioned with the trailers vs. roof top, again the roof top tents lose to ground tents in terms of group size. Ground tents will probably always be the king for very large camping groups, given the nature of them and the simplicity of the camping method. RTT’s are meant for small groups 2-3 people usually is ideal. However as we know, with ground tents, you can get some monster size family tents that cater for up to 12-15 people. This is impossible for a RTT. Given the cost of roof top tents, you can expect much higher quality materials used in its production. Things like stainless steel hinges can really reduce breakages and the heavy walled canvas can withstand wind, rain and snow. The chances of you having to make any repairs out in the field is significantly reduced. 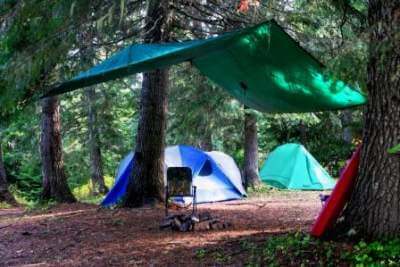 For the ground tents this isn’t the case, tending to broken tent poles, torn polyester panels and leaks is something that comes with the territory of camping with a ground tent. Ground tents are much better for longer camping trips with larger groups. If you really want to buckle down in an area for a couple weeks, ground tents would probably offer a better experience with a large Cabin Tent for example as they have large spacious rooms, which are more homely in comparison to a roof tent. RTT’s were created for on the move camping trips where you get off road and visit remote areas in nature. So now you have the full details on each option, this will hopefully help you to make an informed decision on either. IF you feel there are some other important factors not mentioned here, comment below with your opinion and ideas.